As regular readers of An Sionnach Fionn know, I am generally sympathetic to Israel and tend to see its history and present circumstances through Irish eyes. However that background also means that I have great empathy for the position of the Palestinian people, both inside and outside the borders of the former United Kingdom Mandate. In Ireland we know and understand military occupation, both historically and more recently in relation to the conflict in the north-east of the country. Since the 1980s the people of Palestine have lived with the expanding presence of Israeli “settlements” in the Occupied Territories of the West Bank, Jerusalem and the Gaza Strip, exacerbating the suffocating weight of the occupation. Of course, colonialism and displacement is another thing we have experienced on this island nation, to our great misfortune. The coalition government led by Benjamin Netanyahu in Jerusalem, composed of nationalist and religious parties like Likud, United Torah Judaism, Shas, Kulanu and the Jewish Home, seems set on making the Jewish State a pariah among the countries of the world, with only a future Trump-led United States ready to countenance the establishment of a “Greater Israel” in the Middle East. The international community is clearly in no mood to further tolerate a nation claiming “Western values” while acting like a Third World dictatorship, defying expected global norms in a manner that long-ago brought the apartheid-era South Africa to heel. This brings me to the video recording below, where Muamen Shteiwi, a seven year old Palestinian boy, is held by Israeli Forces following protests at the village of Kafr Qadum, in the West Bank. Residents of the area have been cut off from the nearby Palestinian city of Nablus since the military blocked the road to protect the expansion of the Jewish settlement of Kedumim in 2003. Demonstrations in the region have become a regular affair, except that this time masked soldiers were hidden under camouflaged tarpaulins, waiting to ambush the protesters. Some readers – especially in the US – might see Shteiwi’s detention as a perfectly reasonable response, given the violent circumstances. A child throwing rocks at heavily armed military and paramilitary personnel in armoured jeeps is a danger to himself, if not to others. However, that hardly seems the intent of the thug-like Israelis who hold the child in front of them, for protection or as a dangling bait, while jeering at the Palestinian protesters behind the camera. 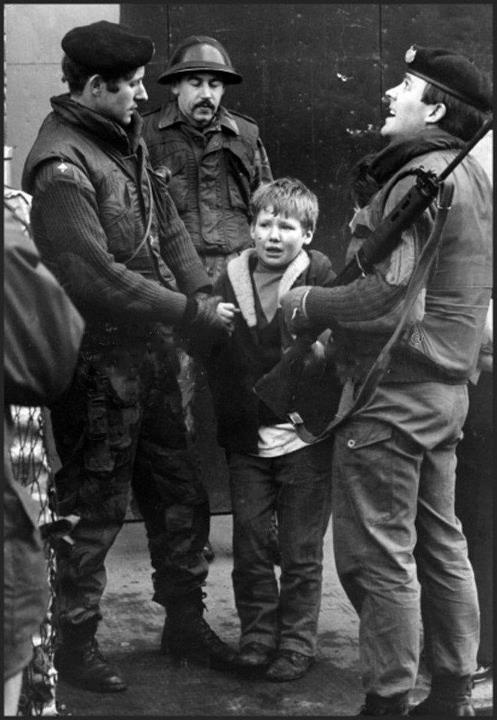 I – like many, many others – remember the early days of the Long War in the UK-administered Six Counties, the so-called Irish-British Troubles, and the “Saturday morning matinees” in the strife-torn city of Derry. Children free from school at the weekend would head down to the barricades and waste-grounds to confront the British Occupation Forces, despite the wishes and best attempts of their parents to keep them safe. Here, in the bloody remnant of Greater England’s colony on the island of Ireland, boys as young as seven would jeer at the soldiers, who would respond with curses or with speeding armoured vehicles. Sometimes the regular clashes would escalate, stones and bottles replacing catcalls, rubber bullets and CS gas replacing curses, until the “older lads” would come down in the afternoon and evening, carrying crates of petrol bombs, their faces obscured with scarves and beanie hats. This resistance to occupation by civilian youths of all ages – and later genders – was as routine as going to school or to work, a part of daily life, a fixed time or date in the yearly schedule. Both sides were settled into a decades-old Long War until eventually Britain, pressured from within and without, blinked first and the slow torturous years of secret and not-so-secret negotiations could begin. Peace eventually came to Ireland because the (Provisional) Irish Republican Army and Sinn Féin were in a position of strength, able to endure indefinably, while the United Kingdom was in a position of weakness, perennially trapped between defeat and victory: unable to accept the former, incapable of achieving the latter. Compromise on all sides was and is the chief characteristic of the Dublin-Belfast-London-Washington peace process of the late 1980s to early 2000s. The main participants were given no option but to reach an agreement, Downing Street, Stormont Castle and the Palace of Westminster in the UK harried and pushed into an accommodation by the White House, State Department and Congress in the US. Which, of course, is an implicit acknowledgment that contemporary Israel is not like the secular nation-states of the West that we know but instead bears a closer resemblance to the multitude of “Arab Republics” and “Islamic Republics” which neighbour it. It is not a democracy as we in Europe or North America would understand it, but is rather an ethnocracy, one based on the ethno-religious identity of its ruling community. That is both its short-term strength and long-term weakness. As with the former one-party unionist state of “Northern Ireland”, established by Britain’s democracy-thwarting partition of the island of Ireland in the early 1920s, an anti-democratic minority surrounded by a democratic majority will eventually succumb to the latter. Given the Irish example, not even the unfailing enthusiasm or partisan sentiment of Donald J. Trump and company can change the terminal fate some Israelis are dooming their country to. On the one hand you have Israel backed by billions in US military aid and billions more from rich Jews around the world. On the other an increasingly islamist Palestine funded by islamonazi Arab states and Iran. Extremists on both sides ready to annihilate one another. Israel’s nukes are only reason it hasn’t happened yet. I used to be solely sympathetic to Palestinians but that changed when they became less dominated by groups like PFLP and more towards the islamonazis of Hamas. Now I have little sympathy for either. We have people like that in Ireland too. They refuse to recognise the free Irish state and believe we should be part of the British Commonwealth. They go to great lengths lamenting our spending on reviving our own culture and language at any given opportunity and even honour the enemy’s dead at the centennial of the struggle for our national freedom. They refuse to acknowledge or speak our country’s first language and generally try to wipe out any vestige of pre-English occupation history and civilisation. We call them West-Brits. Refreshingly, it appears that most Israelis seem not to agree with their extremist brethren. The only thing holding them back is the currently overwhelming perception of a threat of extermination posed by a nuclear Iran. There simply is no excuse for placing a small child, no matter how indoctrinated, in the line of fire. Hopefully, there will be a backlash from the moderates to the publication of this atrocity. I do not think the Palestinian struggle can, in its essence, be really compared to the Irish struggle. When viewed in terms of territorial claims, our situation is very clear. Theirs is completely muddled (especially since, really, they are the same folks-minus their respective non-semitic adherents), largely by the fault of our so “stupendous” occupiers and the previous “masters” of their territory, the Brits. Israel and peace. Well, Israel is a theocracy, like Iran. Unlike Iran the Chasidim can be voted out. Like Ireland it favours coalitions with small parties calling the shots. As to the ceasefire in the north, both sides faced a 1917 style trenches stale mate, South Armagh, west bank Derry and most border bits could not be held. Nor could they be defeated.